Today is a Friday as ordinary as ordinary can be. We have no particular plans evident by the fact that we are both still in our pajamas as the clock strikes dangerously close to noon. And you know what? That's fine. Fridays like this are reserved for eating cereal for lunch, napping on the couch, reading an actual book with a hot cuppa, AND taking photos. The house is as messy as messy can be. Because we have no particular plans today, I did not particularly tidy the day before. There are used cups on the coffee table and the kitchen sink may be very occupied. The house may not be particularly ready for an impromptu photoshoot but Friday Lucy don't care. Friday Lucy runs for her D750 and snapped these moments that are forever captured. You may think it's silly. You may judge me. You may even agree! These are the moments of our lives and they must be recorded as the stories we recount traveling down this long road. We recount heroic adventures and achievements but also these quiet moments when you find your husband so endearingly adorable, your heart skips a beat. You may roll your eyes but Friday Lucy don't care. Friday Lucy is too busy doing absolutely nothing - except keeping her camera very very close, in case Mike breaks out in another dance session. Friday Lucy will probably leave the camera and go join him this time. Personally, I'd love to try some recipes from my ever growing cookbook collection, become a more knowledgeable crazy plant lady, convince my husband to let me get a puppy, consistently keep a clean kitchen (how embarrassing is that?! ), and read more for leisure. What are some of your resolutions this year? Today I will share about how deeply I regret not keeping up with the written Chinese language. (At least I speak it completely fluently, which is more than I can say for my darling husband) Apparently I’m still prideful… with a touch of defensiveness I might add... joy. Why, one might ask, am I regretful? After all, I live in America where the official spoken and written language is English. I operate a business domestically; and as I mentioned, my husband if stripped of the English language, wouldn’t get past the communicative skills of a Chinese toddler. 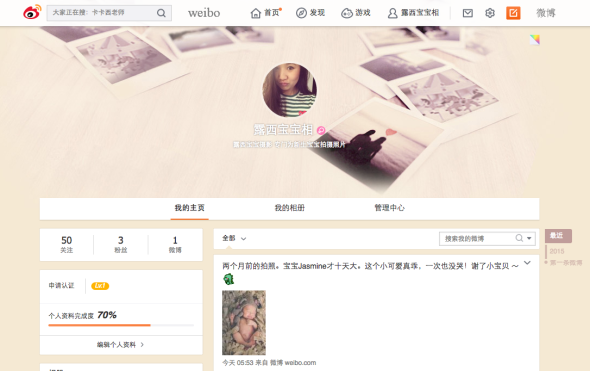 Well, inquisitive one, it’s because I’ve officially established a presence on Weibo, the Chinese twitter. In an effort to market myself to the entire client base here in SGV in SoCal, I’ve inquired into setting up yet another social media account. Last Saturday morning, I set up a marketing meeting with a good friend and ex-coworker of mine in old town Pasadena and registered myself on Weibo. Even though we are just days apart in age, I felt entirely like I was a good few generations older than her, asking a myriad of questions and feeling utterly overwhelmed and inadequate to operate my own twitter. In truth, I am ill-equipped since the whole thing is completely in Chinese. Here’s the most recent post I put up (an engagement shoot in Malibu), took me a good few minutes using every single brain cell and concentrating like my life depended on it. After just a few words I felt so very spent and so very regretful that I didn’t listen to my parents… I could’ve been a pro at this but instead, with each painstaking word, I am reminded that parents do know best… at least on the subject of keeping up with Chinese. Shame on me for not listening... and see ya on Weibo!